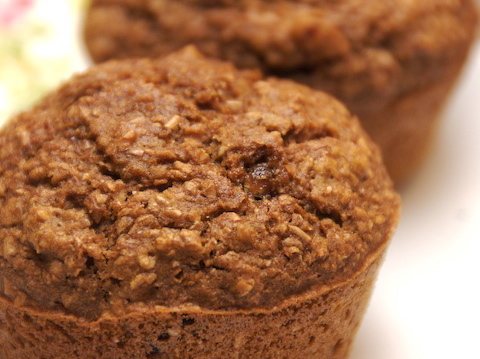 I like eating bran muffins as midmorning snacks during the week, so on Sundays I often make a batch. Despite my good intentions to ration them, they're usually gone by Tuesday noon. Rolled oats give these muffins a lighter texture; dried cranberries are my favorite addition, but feel free to substitute raisins, dried cherries, currants, or other dried fruit. The recipe is adapted from the Best Bran Muffins in [%bookLink code=0812969677 "The Laurel's Kitchen Bread Book"], by Laurel Robertson (with Carol Flinders and Bronwen Godfrey). Preheat oven to 375 degrees. Grease or line a muffin tin. In a medium bowl, sift together the flour, soda, and salt before stirring in the bran and the oats. In another bowl, beat together the oil, sugar, and molasses before adding the egg and buttermilk. Stir the bran mixture into oil mixture, then fold in the dried cranberries. Place batter in the muffin tin, filling each muffin space about three-quarters full. Bake for 15 minutes, or until a toothpick inserted in a muffin comes out clean. Serve warm, with butter and jam if desired. If, like me, you have trouble keeping fresh buttermilk on hand, you might try dehydrated buttermilk. I have had good luck using it in this recipe. You can also freeze buttermilk in smaller portions, to thaw out as needed for baking.